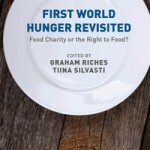 New book: First World Hunger Revisited Food Charity or the Right to Food? First World Hunger Revisited exposes the hidden functions and limits of food charity and corporately sponsored food banks as primary responses to widespread domestic hunger and income poverty in twelve rich ‘food-secure’ societies and emerging economies: Australia, Brazil, Canada, Estonia, Finland, Hong Kong, New Zealand, South Africa, Spain, Turkey, the UK and the USA. Who wins, who loses when governments violate their Right to Food obligations under international law to ensure the food security of their vulnerable populations? It challenges the effectiveness of food aid and argues for integrated income redistribution, agriculture, food, health and social policies informed by the Right to Food, whilst critiquing the lack of public policy and political will in achieving food security for all. This second edition is edited by Graham Riches and Tiina Silvasti, and published by Palgrave Macmillan. This entry was posted in Books on September 11, 2014 by admin.